The Aradhana of our Daivee Chetana Sri Raghavendrateertharu falls on August 7th.Poorva Aradhana, 8th.Madhya Aradhana, 9th. Uttara Aradhana. The whole world is celebrating the 338th Aradhana remembering and praying to our Yatiraat.I really convey my pranams to those who celebrate. Beloved GuruRayaru disappeared from our sight. The owner and the master of Abundant Punya - Akhanda Punya Raashi never used anything for his personal use. Karunaalu reserved the entire thing for the sake of the devotees and liberally distributing and doing the Uddhaara of our Manukula. When we just remember the day of Brindavana Pravesha our eyes become wet with tears and the heart simply cries. So far no Yatis have thought about the stones of their Brindavana. But Rayaru a week before the Brindavana Pravesha did not accept the Brindavana prepared by Diwan Venkanna.Said let this Brindavana be in Mantralaya and will be used for the coming Yati. That Brindavana was used for Sri Vaadeendrateertharu. So Sri Raghavendrateertharu personally went to Madhavar along with Diwan Venkanna selected the stone for his Brindavana and said to Venkanna that on this holy hilly rock during the Vanavaasa of fourteen years Sri Ramachandradevaru has taken rest for SEVEN GALIGE ( two hours and forty eight minutes). So it is most holy and sacred. Extract the stones from this rock for the construction of Brindavana. As per the advice Venkanna did it soon as the time was very short. We can say perhaps THIS WAS THE LAST SANCHAARA of our beloved kind Yatiraat Sri Raghavendrateertharu along with Venkanna. From the next day Rayaru did not move from Mantralaya. So GuruRayaru selected himself the stone for his Brindavana. Never perturbed, nor felt sorry for entering the Brindavana. The same smile and soft interaction affectionately with all the devotees. This made the devotees to think more and feel sorry that after a day we will not be able to see Rayaru, enter Brindavana and disappear from our sight. We are amazed to know the multifarious divine personality of our Sri Raghavendrateertharu. 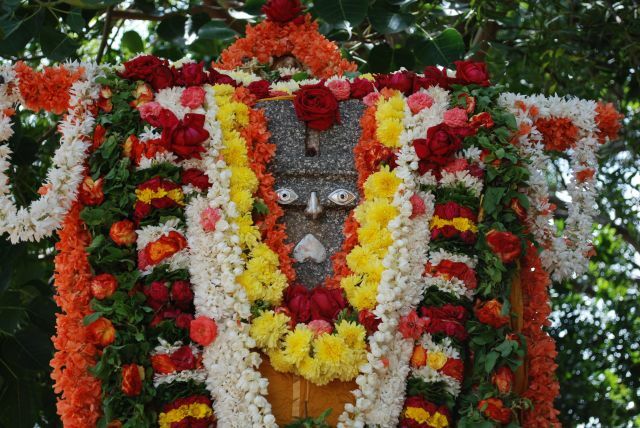 It is quite interesting to know that the Brindavana stones selected by our GuruRayaru are used to the Ek Shila Brindavana by Bichali Sri Appanacharyaru at the Japadakatti. Bichali Sri Appanacharya after the Brindavana pravesha of Rayaru started living in Mantralaya only. One day Rayaru appeared in the dream of Appanacharya and said go to your place Bichali. After going daily he used to come to Mantralaya from Bichali crossing the river Tungabhadra. At that time there was no dam, abundant forceful flow of Tungabhadra, but Appanacharya used to swim without caring the forceful flow, so Kind Sri Raghavendrateertharu one day appeared in the dream of Appanacharya in Bichali and said now onwards you do the Pratishthhaapana of Ek Shila Brindavana on the Japadakatti where we used to sit together and talk daily, I will daily give Darshana to you in the form of Jyoti. So do not come to Mantralaya. Dear devotees, see how kind is our Rayaru and taking care of his devotees. Bichali Sri Appanacharyaru through Sri Raghavendra Gurustotra introduced Rayaru to the whole world. Our Uttanooru Sri Gopaladasru has said in one of the suladis. During Chaaturmaasa while sitting with Sri Yogeendrateertharu Rayaru asked Diwan Venkanna to announce the day of Brindavana Pravesha on Shraavana bahula Dwiteeya Poorvashrama son Sri Laxminarayanacharya and nephew Sri Narayanacharya started weeping. Rayaru said how innocent you are ! Do not feel sorry, I am not going anywhere! I am not giving up my body, I will be sitting in the Brindavana to follow the dharma of the world devotees as per the order of Sri Hari. I AM NOT GIVING UP MY BODY I WILL BE IN MANTRALAYA YOU CANNOT SEE ME - ONLY DISAPPEAR FROM YOUR SIGHT. On the day of Shraavana Pratipada Sri Raghavendrateertharu performed the pooja of our Sri MoolaRamadevaru with devotion and grandeur. Kind interaction with all the devotees with a smile, offered Teertha Phala Mantrakshate and accepted the Bhiksha with all. After that engaged in the preparation of the next day Brindavana pravesha. Diwan Venkanna used to go here and there finding a lonely place and will weep. His grief was at its utmost. His Guru Araadhya Adhi Daiva is disappearing shortly. Looking at the STHITAPRAGNYA OF RAYARU the gathered devotees became dumb. They simply shed tears and said that we are loosing such an eminent divine personality. We cannot see Rayaru like this from tomorrow onwards. The devotees, the paraphernalia of the SRS Mutt - Vidya Mutt were simply shed tears including the Mutt Gajaraja Maandhaata and the kid elephant Laxmi, the calf and the cows and even Varunadeva also joined with showers, incessant showers on that day and expressed his deep sense of sorrowful feelings. Devotees the day had come that I will have to disappear from your sight. Do not feel sorry for my departure Sri Yogeendrateertharu will continue the Tradition and will take care of you. Though I will be in Mantralaya Brindavana you can call me any time, anywhere. Definitely protect you. We have to follow the orders of Sri Hari. Though I am in Brindavana Sri SriMadacharya granthhas, Sri Jaiteertharu granthhas and my writings are here for your guidance and ready reference. Follow them with faith and belief. Be always on the right path, do not hurt the feelings of others under any circumstances. Have Faith in Sri Hari Vayu and Guru and you will be Blessed in life in all your endeavours. Immediately after the Brindavana pravesha our GuruRayaru proved the Miracle to his dearest and the greatest devotee Bichali Sri Appanacharyaru.As Appanacharyaru could not be present at the time of Brindavana pravesha and did not have the last Darshana, the grief overflowed, Chaturveda Pandita, Aparokshagnyani, Vice chancellor and the Profeesor of the Open University of Japadakatti Appanacharya through Ashukavitva composed Sri Raghavendra Gurustotra that too while crossing the river Tungabhadra which was in full spate. Appanacharyar Love, Affection and Regard together spontaneously rushed in Gurustotra. The Divine Personality of our GuruRayaru is presented to the world through this Sri Raghavendra Gurustotra. Dear devotees to know Rayaru please chant with devotion and understand the real meaning of Sri Raghavendra Gurustotra. Appanacharya owing to grief and devotional ecstasy cannot speak out any thing more, shed tears, fell down and performed Saashtaanga to Rayaru. SAAKSHEEHAYASTOTRAHEE. All those who were gathered there listened this voice of Rayaru. Sri Appanacharya said happily continued and completed. Krutam Stotram Idam Punyam Sri MatbhirAppanabhidahihi. Dear Devotees when all these things like a flash back appear to our inward eyes we really feel the absence of Rayaru and miss the divine presence and tears roll from our eyes. Divine Chetana Sri Raghavendrateertharu is below the Brindavana of Mantralaya with Yoga siddhi. Always Blessing, protecting and helping the Devotees. The abundant songs and padasa of our Haridasas are the witness for this. Though we cannot see Rayaru with our bare eyes we see Rayaru through our inward eyes. He is Blessing us sitting in the Brindavana. This much of Anusandhaana is needed, this much of firm faith and unalterable belief we devotees must follow. We are really Blessed by this great Yatiraat the Seventeenth Pontiff of our Sri SriMadacharya Peetha, Rayara Mutt, Vidya Mutt Sri Raghavendrateertha Gurusarvabhoumaru. Maam Raksha Sri Raghavendrateertha Prabho. Sri Raghavendrateertha Gurusarvabhouma's Aradhana details at the Sanctum of Bichali Japadakatti - Bichali Sri Appanacharya's favourite place and the Miracle of Rayaru are described in Mantralaya(310). The world devotees have celebrated Shraavana Bahula Pratipada, Dwiteeya and Trateeya as Poorvaaradhane, Madhyaaraadhane and Uttaraaradhane with great devotion and affection celebrated the 338th. Aradhana Mahotsava of our Yatiraat Sri Raghavendrateertha Gurusarvabhoumaru. Bent with gratitude towards Mahan Chetana. Aradhana means expressing our regard, love, faith, belief, divine rememberance and worship. Aradhana means to know the importance of the Mahan Chetana and the Mahima Miracle of Sri Raghavendrateertharu. That too our Rayara Aradhana means we will be celebrating the worship of Sri Hari, Ram, Krishna, Narahari, Vedavyasa, Sri Vayudevaru Sri Madhwacharyaru,Sri Jaiteertharu,Sri Vijayeendra-SriSudheendrateertharu. All these sacred Yatis Sannidhaana is always Jagruta and Sannihita. So the world devotees are celebrating the Aradhana of Sri Raghavendrateertharu through out the world. Every where the overflow of Bhakti and sharing the devotion with joy through Worship, AnnaSantarpana, Bhajan,PravachanaRathhotsava etc. I wish to share the Miracle of two Aradhanas of 338th.One in Bichali Japadakatti and the other one is of Newzealand. In this series of Mantralaya(310) I wish to describe the Aradhana details and the Miracle of Rayaru at Bichali. Appanacharya was daily going to Mantralaya to avail the Darshana of Rayaru by crossing the river Tungabhadra and returning to Bichali in the same way. This continued for a long time. Then Rayaru thought of his most favourite and beloved Bichali Appanacharya that actually he is a struggling a lot to cross the river Tungabhadra river, at that time it flowed with full swing as there was no dam Tungabhadra dam. Kind Rayaru Bhaktaanugraha Premi said to Appanacharya do not come to Mantralaya, do the pratishthhaapana of Ek ShilaBrindavana at the Japadakatti where we used to sit together daily and Rayaru said will give Darshana to you daily there only. As per the promise Rayaru daily giving Darshana to EkshilaBrindavana through Jyoti Roopa even to this day. Shraavana Bahula Dwiteeya the Tungabhadra is flowing forcefully with a lullaby day in and day out saying : Bichali Sri Appanacharya Priya Mantralaya Sri Raghavendrateertha Gurubhyo Namaha at the Japadakatti in Bichali. This lullaby of Tungabhadra is the Quick Siddhi Mahamantra of our GuruRayaru to attain everything in life to the world devotees. When we enter towards the Bichali Japadakatti first we find the house of Sri Appanacharya at the left side. There we find a board - Sri Appanacharya's house. Saffron flags are flying and showing the direction to the Japadakatti and proclaim that this is the most Siddhi Kshetra of Sri Raghavendrateertharu and this is the ecstasy of Bhakti of Sri Appanacharyaru. Thus welcome the devotees with warm affection. Devotees have grown in large number.Sri Badadha Ramacharya describes the details of Japadakatti - Bichali - Appanacharyaru - Mantralaya - Sri Raghavendrateertharu in Telugu, Hindi, English and Kannada. The style of presentation is superb, the fluency is excellent and simply he takes us to those days of GuruRayaru and Appanacharyaru with complete involvement. The devotees are highly satisfied by this decent description. The Vamshasthharu of Bichali Sri Appanacharya all the brothers in general and Badadha Sri Ramacharya in particular are really praise worthy for the way they have arranged the Aradhana for three days Poorvaaradhane,Madhyaaradhane,Uttaraaradhane. They have not gone for door to door collection towards the Aradhana nor any financial assistance from any where. His own personal savings and whatever the Devotees of the Ashtottara Shata Seva Samiti voluntarily give accepted gladly and performed the Aradhana meticulously. The creative capacity, the hypnotizing features of his Devotion towards Mantralaya Rayaru and Bichali Appanacharyaru are the main features of his success. In this matter Ramacharya is second to none. On all the three days of Aradhana Panchamruta Abhisheka,Ashtottara Pathana, Alankara Mahapooja and daily new Silk Vastra and Sheshavastra to Rayaru, the Aradhana reached the climax of devotional grandeur. Amidst the Mother Nature's Punya Parisara Rayaru visits daily the Bichali Japadakatti Ek Shila Brindavana in the form of Jyoti. So world devotees it is most sacred and holy. It is my luck and fortune that I participated in the Aradhana of Bichali on the day of MadhyaAradhana along with my son and wife. First Visited Mantralaya had the Darshana of Moola Brindavana of Sri Raghavendrateertharu and then proceeded to Bichali Aradhana Celebrations. It is quite heartening to know that Rayaru accepts the seva only from those to whom he likes. For the Aradhana for three days Rayaru desired the pooja of Mantralaya resident Sri Shankara Rao's son Sri Goutamacharya, a young boy of 21 years. Quite efficient and well versed in Vedaadhyayana,Dharmashaastra and Pooja Vidhaana. All the three days Sri Goutamacharya's pooja Rayaru liked. As already said Rayaru is our : Bhaktaanugraha Premi. On the day of Uttaraaraadhane after Mahamangalarati at night Sri Goutamacharya prayed to Rayaru : GuruRaya I am too young there may be some omissions and deletions in the pooja Vidhaana, if there are any mistakes on my part, please forgive me. Goutamacharya appealed with emotion and devotion. Slept at the Sanctum of Japadakatti room. That day during night at 2-30 am, Goutamacharya got up, he did not get sleep. To his great surprise he saw a man walking near the grinding stone(Varalu Rubbugundu), thought that somebody owing to the heavy food may be just walking. The whole sanctum was in deep slumber except Goutamacharya. He saw with his own eyes. After sometime the man disappeared, then Goutamacharya saw powerful light in front of Sri Vyasaraja Pratishthhaapita Sri Praanadevaru for a long time. The powerful light Jyoti he saw that was below the platform there is a shelf(Maada) in front of Japadakatti Ek Shila Brindavana. Detailed the whole thing in the morning to all the elders including the Archaka - Vamshasthha Sri Badadha Ramacharya. Confirmed that no one has walked during night. The man who walked is none but Rayaru. Highly pleased with the Aradhana Seva Kainkarya - Pooja of Sri Goutamacharya during the Aradhana. So Rayaru gave Darshana to Goutamacharya and as usual as per the word given to Sri Appanacharya appeared in the form of Jyoti near Sri Vyasaraja Pratishthhaapita Praanadevaru. It is a great Miracle of Mantralaya Sri Raghavendrateertharu. Blessed Goutamacharya , Rayaru appreciated his honesty and sincerity, though he performed the pooja as per our Pooja rituals and Pooja Vidhaana. Dear world Devotees Goutamacharya is lucky, got the Pratryaksha Darshana of Rayaru at the Bichali Japadakatti. Several Rushi Munis Devotees constantly pray to Rayaru and perform Sankalpa Seva. See how fortunate is this young guy. The golden opportunity given by Ramacharya we say Rayaru inspired. Sri Badadha Ramacharya's selfless Seva Rayaru always desires and there by Blessing the world Devotees through the Ashtottara Shata Seva Samiti of Bichali Japadakatti. The Seva of Sri Appanacharya Vamshashthharu is really a boon to all of us. So this Miracle happened in Bichali. Rayaru said Aradhana well done, pleased, Blessed you all. This is the Niropa of Rayaru on the concluding day of Aradhana. Devotees Rayaru is daily visiting Bichali Japadakatti, the Tungabharda holy Snaana, Aahneeka, Anushthhaana and then sit at the EkShila Brindavana in JyotiRoopa. This is the routine of Rayaru. Only the lucky and the fortunate have the chance of Darshana.